Like Austin, Seattle is facing an affordability crisis. In the first story in our series "Growing Gains," we go to Seattle, where the city is trying to make sure every resident gets a say in how the city grows. Not all city initiatives are about building something new. Take the move then-Mayor Ed Murray of Seattle made in 2016. By executive order, Murray cut ties with the city’s 13 district councils – basically, citizen groups representing different regions of the city. For decades, the city had allocated resources and funding to these councils. In a press conference announcing the change, Murray said his decision was in the name of diversity. A 2013 survey of the volunteer councils found that many members were white homeowners over the age of 40. That, Murray said, was incongruent with the makeup of Seattle, where the median age is 36, the majority of homes are rented and roughly a third of the city is nonwhite. PART 2 | Denver Is Testing Housing Vouchers For Middle-Income Workers. Austin Will Be Watching. PART 3 | Portland Is Trying To Help People Return To Gentrified Areas. Austin Has Similar Plans. “We cannot move forward if most of the people in this city, the diversity in this city, are not represented in the very neighborhood groups that this city helped fund and runs,” Murray said. Historically, when the City of Austin wants feedback on how to handle growth, it tends to hear from residents living in wealthier parts of the city and people who own their homes. For example, a map the city released during discussions about CodeNEXT showed most of the feedback focused on wealthier parts of Austin. The City of Seattle is trying several new policies to redistribute the power historically given to white, older homeowners when it comes to the voices it hears at City Hall. Seattle officials believe the policies could be replicated in other cities, like Austin. “It’s on the government for us to think through – OK, how are we going to [people who don't typically participate in local government] and meeting them where they are?” said Andres Mantilla, interim director of Seattle’s Department of Neighborhoods. Mohamud Yussuf immigrated to the U.S. from his native Somalia, by way of Kenya, in 1996. When Yussuf’s flight from Nairobi landed in Seattle, there was no welcome party to greet him, his wife and four kids. Instead, there was this white stuff. “I was surprised to be welcomed by snow on the ground,” he said. Yussuf settled in a neighborhood in Southeast Seattle. He said at the time the Somali community was small. He started a community newspaper and raised his children. Slowly more Somalis moved into his neighborhood. By 2011, according to census numbers, more than 1 in 5 of Yussuf’s neighbors were from East Africa. 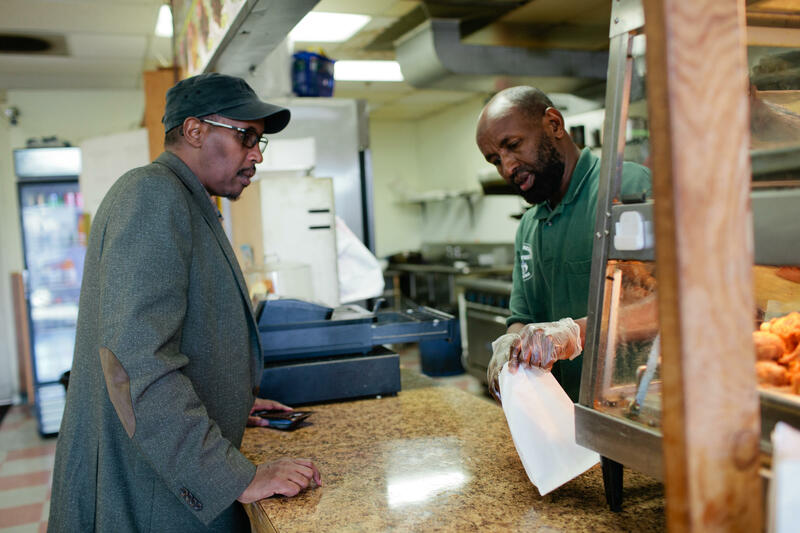 Mohamud Yussuf buys samosas from Ahmed Farah at the Amin International Grocery and Deli in Southeast Seattle. Many of the neighborhood's residents are from East Africa. “From haircut to restaurant to grocery store – I could hear my music, see my people walking around with hijab," he said. In 2016, Yussuf started working for the city as a community liaison. The program, which started in 2009, pays community leaders $50 an hour to bridge language and cultural gaps between their neighbors and the city. “If we’re valuing their time and engaging them in a meaningful partnership, then we should be paying them at a competitive rate,” Mantilla said. “Not just going in there, gathering the feedback and just taking it. Really, again, honoring and respecting their time." Seattle now employs 76 community liaisons who speak over 40 languages. At the same time, like many cities across the U.S., Seattle is facing an affordability crisis. The median cost of rent plus utilities has nearly doubled since 2006, to $1,448 a month. Yussuf worries that the community he’s being paid to help won’t be living in Seattle much longer. When the City of Seattle cut funding to majority-homeowner district councils, it also had to figure out how to get more renters involved in City Hall. Renters tend to have lower incomes than homeowners and face certain barriers when it comes to attending City Council meetings or testifying at a city commission: issues like unreliable transportation, unaffordable child care and simply the time to participate. A recent study out of Stanford concluded that renters are also less likely to vote in national and local elections than homeowners. When zoning is on a local ballot, homeowners go to the polls more. And the more a home is worth, the more likely the homeowner will vote. "I don't think politicians are really that good at making language accessible." In 2016, Seattle created a Renters’ Commission which, according to the city, is the first of its kind in the U.S. The group of volunteers meets monthly, like any other city commission, to talk about issues facing renters and advise city staff on policies that affect them. “There is no HOA [homeowners association] for renters,” said ChrisTiana ObeySumner, who co-chairs the commission and works as a social equity educator. The commission has been meeting for a little over a year, and while members said things are moving slowly, for the most part, they’re excited for the group's potential. The commission has discussed rent control and renter protection policies. It has written a letter in support of the affordable housing policy in the rewrite of the city’s land development code (similar to the now-defunct CodeNEXT). Calvin Jones, who works for Microsoft, is one of the youngest members of the commission. He said he had never been to a City Council meeting before joining the Renters’ Commission. Jones said he hopes the commission can, at the very least, translate for other renters what’s happening at the city. Ideally, it would do more. According to census data, renters live in 55 percent of Austin housing units. 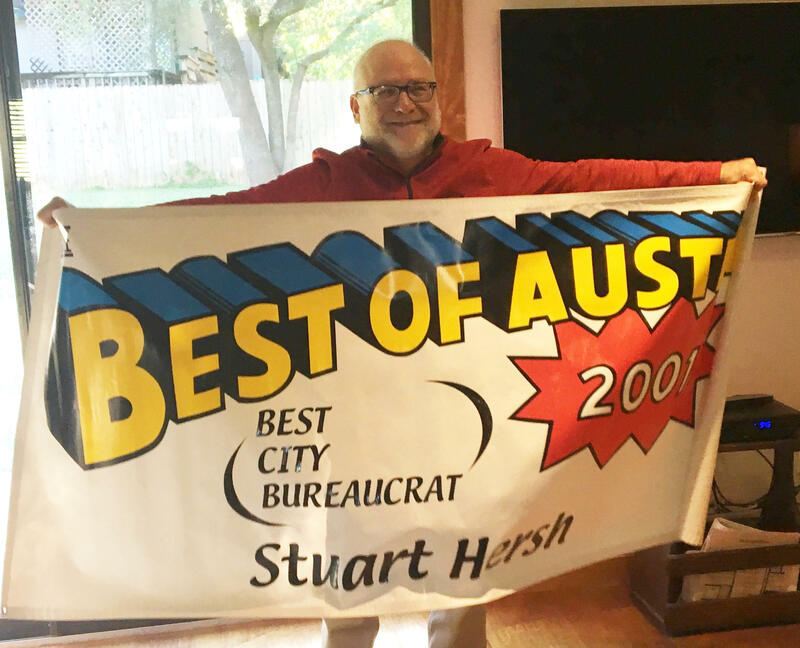 Stuart Hersh holds up a banner of an award he won from The Austin Chronicle in 2001. Hersh, who worked for the city for 30 years, said he wanted to set himself apart from the homeowners who often also testified. Hersh said he thinks Austin has done a better job with public outreach in the past several years. For example, he said, during discussions on CodeNEXT the city held meetings in every council district. During one meeting, the city provided headsets to translate the presentation into five different languages – although only two people ended up using them. The city does not track whether those who give community input are homeowners or renters. But it is hoping things like location changes, more opportunities to give input online or by phone, and translating materials into more languages will increase renter feedback. "The planning commission should be the renters commission. The zoning and platting commission should be the renters commission." The City of Austin has not formally discussed creating a renters commission. But Council Member Jimmy Flannigan, who is currently the only member who rents, said he wants to require that a certain number of volunteers on city commissions be renters. “The planning commission should be the renters commission. The zoning and platting commission should be the renters commission,” Flannigan said. He said he doesn’t like the idea of creating a renters commission in the way Seattle has because renters could be further siloed. “I don’t want to create a renters commission if it’s just going to solidify the fact that all the real decisions get made by homeowners at [the] Planning [Commission],” he said. Hersh said Austin can start with something easy: Pitch to renters why they should care about certain policy issues. Take budget discussions, for example. Every year the city calculates how its new budget will affect the property taxes of homeowners – but not the fact that renters are also affected by these tax increases (though indirectly). “[Renters] can make a clear connection between what’s being discussed and their lives,” Hersh said. Two years ago, Hersh stopped introducing himself as a renter at City Council meetings. At the age of 65, he had bought a house – but only after his parents passed away and left him money, so he felt he could comfortably afford to do so. When he traces the four decades he’s spent in Austin, it’s been as a renter in multiple neighborhoods – an efficiency in Hyde Park, a duplex in Hancock. And even though Hersh now owns a home, he’ll still introduce himself as a (mostly) lifetime renter. For the first time in four years, the housing choice voucher program – formerly known as Section 8 – has reopened its waitlist to Austin residents in need of rental assistance. Austin is slowly making progress toward becoming a more affordable city, according to a new analysis, but many residents are still finding it difficult to pay for housing.